New iMacs With Intel Sandy Bridge Processors and Thunderbolt Coming in 4 to 6 Weeks? One thing about Apple is they like to stick to release cycles, and one of those release cycles tells us that iMac is getting ready for an update. According to CNET’s Brian Tong, it could be sooner rather than later. A post over at MacRumors brings news of some tweets by the aforementioned CNET reporter claiming that his sources are telling him that an iMac refresh is near with Intel Sandy Bridge architecture and Thunderbolt to be included. – EXCLUSIVE: My Sources: New iMacs en route by ocean to U.S. available end of April or 1st week of May. No major cosmetic changes. 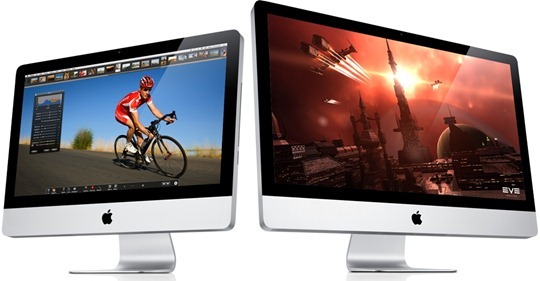 – My sources say New iMacs will feature Sandy Bridge and Thunderbolt. No other specifics. – We’ll see if this pans out, but I’m highly confident in my source. If you’re looking for a new iMac. WAIT FOR IT! The update with give the iMac range parity with the new, updated MacBook Pro family in which Thunderbolt debuted recently. The Apple-Intel joint venture gives lightening (see what I did there?) fast transfer speeds and display output through the one port. While there are no real peripherals that are Thunderbolt compatible at the moment, it’s expected the new port will become a favorite for those still disappointed by the demise of FireWire.